Humans have a field of vision ranging from about 180-200 degrees horizontally which is arrived at through a combination of the foveal and periphal visions. This means that at any given time there are between 160 and 180 degrees that a player is unable to view. With the range of degrees that a player cannot see being almost equal to the range that they can, the part of the field a player cannot see is also a key facet of the game. This area that a player cannot see is what is known as the “blind side”. How teams manipulate its qualities to their advantage is a key aspect of the game that impacts several phases in different ways. One key characteristic of effective offensive play is knowing what an opposing defence focuses on to function effectively and making it as difficult as possible to focus on these things. This is why quick and effective ball circulation is more important against a zonal defence whilst quick and effective player movement is more important against a man-oriented one. This ability to make defensive reference points difficult to focus on, is the main strength of blind side positioning. As the name suggests blind side positioning is simply where one positions themselves on the blind side of an opponent. Regardless of their defensive system, the players in a defending team need to be able to see the ball. The position of the ball including its proximity and the speed it is travelling at gives various cues for defenders in terms of their positioning, the timing of their actions and the level of danger an attack poses. Direct view of opponents is also important for defenders giving many similar cues to the ball. Although this is more system dependent given that it will be more important for a man-oriented defence than a zonal one, it is still important for all defenders. The major issue that blind side positioning causes an opponent is that it essentially requires them to prioritise in terms of their field of vision. With a player positioned on the blind side of their opponent, they force this opponent into choosing between being able to see either the ball or the “man”. Louis van Gaal is one manager known to use the blind side strategically and this use is inherent in his “contra” concept. In the above quote LvG refers to a number of interesting factors. One of these, as I mentioned before, is one of the main benefits of blind side positioning, the inability of the defender in question to view both the ball and their opponent. If the defensive opponent chooses to view their opponent exclusively, the ball carrier can move with the ball and the situation around them can change pretty drastically by the time he next sees the ball. This means the defender’s choice to keep their opponent in sight could be rendered useless anyway. The alternative, consisting of prioritising vision of the ball, means the player on the defender’s blind side can move off potentially unopposed which is almost equally dangerous. As a further part of his contra concept, van Gaal instructs his attacking midfielder to move in the opposite direction to the ball. This creates interesting possibilities in penetrative passes. 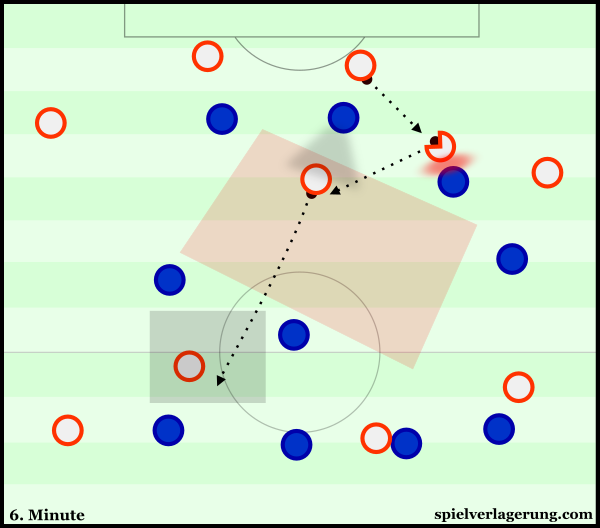 With the player in question moving in the opposite direction to the ball they create a diagonal distance meaning the passing route is of a diagonal nature; the benefits of which have been extensively analysed here on Spielverlagerung. Not only does it create the potential for diagonal passes to break the opposing midfield line. But due to the recipient moving against the grain (in the opposite direction to the opponents) this simple mechanism can create dynamic superiority. Initially the two forwards are doing a good job of covering the opposing double 6, however as the ball is switched to the LCB the left sided 6 drops into the defensive line taking the forward with him which allows the LCB to take the ball forwards. The ball-near central midfielder pushes up to engage the LCB. As the red LCM narrows in to provide cover and the winger to his left does not adjust enough, a little disconnect is created, allowing the space for the diagonal pass into the number 10. With the opposing defence shifting towards their right in relation to the ball and the number 10 moving in the opposite direction he has a potentially crucial temporal advantage ahead of his next action. This advantage is created by the need for the defenders to stop and change direction before moving towards the ball carrier whereas the ball carrier should be able to immediately continue in the direction they wish to. Positioning players on the blind side of an opponent can create several other issues on a deeper level. On an individual defensive level the perceptual focus points have been split in a way that makes it difficult to act on both. However in order to defend well that is exactly what they need to do; essentially multi task in terms of what they are focusing on. To cope with this the defenders in question need to constantly check their shoulders to be aware of slight movements behind them and any changes to the ball’s location in front of them. With multi-tasking comes another problem; attention. Continuous partial attention theory is one way of describing how the human brain copes with multi-tasking. Essentially it argues that the brain can only give each task partial attention meaning we run the risk of missing relevant details. In this case this is dangerous due to the dangers that both the ball carrier and the opponent on the blind side can pose in the short term. Of course this is just one theory but it shows the inherent difficulty of multi-tasking. On a collective level blind side positioning can force your opponents to over compensate defensively, opening up space in other areas. Defensive movements against the 10 space are a good example of this. When faced by opponents overloading the 10 space many teams’ midfield line react by moving deeper and narrower. If they become too deep and narrow they will lose access to defend the space in front of them and the flanks thus making themselves vulnerable to progressions from these areas. As we can see blind side positioning can cause defenders major issues, so how can this be used strategically to increase the potency of attacks? Strategic use of the blind side has a lot to offer in a team’s build-up phase. Passing to the blind side of an opponent is somewhat inherent in vertical passing. A common example is when a striker steps forwards to press a defender and the defender passes vertically into a midfielder. In this situation the defender has passed to the forward’s blind side. So how can this be beneficial as a strategic tool in build-up? As mentioned previously, in football the ball is a massive defensive reference point, not only in terms of positioning but even more in terms of perception and actions. The position of the ball indicates to the defending side how immediately dangerous the opposition attack is and what actions to carry out to minimize any potential threat. If we reduce defending to its most basic aim which is simply to stop the ball from ending up in the net, the importance of seeing the ball is self-evident. It is no surprise therefore that most defenders prioritise being able to see the ball. Of course different teams and players respond to certain events differently based on their team’s tactical approach, mentality, game state and several other factors. However passing to the blind side of an opponent often forces the said opponent to “turn out”. By this I simply mean they must re-adjust their body position to regain vision of the ball. Knowledge of this enables a strategic manipulation of the opponents’ focus and, in turn, coverage. An advantage therefore of blind side usage in build-up is the ability it gives to generate free men. By moving the ball to alter the opponent’s visual focus a team can create the necessary separation to allow one of their players to move without being tracked or reacted to. A simple combination of a vertical pass followed by a backwards pass to the same player is enough to momentarily generate a free man against most teams. Returning to our earlier example, the ball-focus will distract the opposing forward inviting him to press and leaving the centre back free to receive a return pass. However with the most basic usage it is not truly advantageous as the ball returns to a similar theoretical starting point with little progress made. As the GIF above demonstrates, passing to the blind side of the initial presser makes the initial ball-carrier a temporary free man. However in this case the use is not strategically valuable with the ball returning to a very similar situation as it started. However with strategic use comes a different set of actions, different results and greater potential. The initial ball carrier uses his time as a temporary free man to move into space to receive a return pass and help his team break out of the press. Passing to the blind side of the opponent can be difficult given that the presence of the opponent can, if used well, block passes to this area. Therefore one may need to manipulate their opponents’ positioning to create the space to play into this area. To do so effectively one has to shift their opponents’ reference point. With the ball being a reference point, shifting the ball between feet one can also shift an opponents’ positioning slightly and thus create the space to pass behind them. Another reference point is the body positioning and eyes of the ball carrier. Defenders naturally use this to anticipate what their opponents are likely to do next and using this strategically has vast potential. Sergio Busquets is one player who frequently uses this to his advantage with his exquisite fake passes. He manages to separate defenders, pulling them out of position simply by using his eyes to indicate that he intends to pass into a certain area. Wall passes are an increasingly common method of bypassing cover shadows. Wall passes are first touch passes where a previous pass is simply re-directed by the recipient without any additional force. This of course means the pace on the previous pass is used for the wall pass. Essentially this makes use of the fact that one opponent can only cover a player from one direction, the key therefore is to create an alternative passing route to the team-mate. The alternative passing routes can only be created effectively if the ball can be moved into another position quicker than the opponent can re-position themselves. Therefore it is vital to create a passing option in close proximity to reduce the opponents’ time to react. This is often seen in build-up situations when opposing forwards use their presence to block passes from the defenders into a holding midfielder for example. In response another midfield player often drops to provide an alternative route to the holding midfielder who can now be accessed with a first time pass. When executed well the recipient of the wall pass should be able to receive the ball in front of their direct opponent and advance. Example from Spain’s 2-1 loss to Croatia. Thanks to TP for the image. Another method is a strategic usage of one’s own blind side. A player receiving the ball with a bad field of vision is a well known pressing trigger for several teams. A good example is when a player receives the ball whilst facing their own goal, they will usually be pressed quickly to prevent them from turning with the ball and advancing towards the opposition goal. Therefore by passing to players facing their own goal a team can draw an opponent forwards. With a quick lay off the original ball carrier could be able to access the space left behind. This can be a particularly useful tool to evoke pressure from largely passive opponents and access the space between their lines of defence. Positioning an attacker on the blind side of a defender in crossing situations is one of the more commonly exploited possibilities of the blind side. In crossing situations, like most defensive situations, defenders need to see the ball which is vital in preparing not only their actions such as whether to jump and what direction to move into but more importantly when to do these things. They also need to see any opponents to anticipate or react to their movements and generally to decide on how best to prevent them from getting to the ball. When a striker positions himself on the blind side of a defender he essentially takes away this possibility for the defender. Furthermore such positioning gives the forward what can best be described as potential superiority. If the cross is deep the defender is likely to have to turn out at some point to avoid having to head the ball backwards, and this gives the attacker an advantage. Whilst turning out the defender’s focus is split and due to the action he is performing, challenging for the ball is not always viable. Therefore the timing of turning out is essential for the defender. If this is done whilst the ball flies over the defender’s head they cannot effectively challenge for the ball. This also gives the attacker an advantage in terms of the positions they attack the ball from. If the defender turns out before the ball reaches the target, the process of judging the flight of the ball becomes very difficult. When the defender finishes turning he will have momentarily lost his orientation, and he may not be able to recover it in time to defend the cross. Gonzalo Higuain scored numerous goals from these positions for Napoli in the 2015/16 season, with several defenders ultimately unable to track his movement off their blind side. In these situations it is vital for the defender to assess the flight of the ball quickly and, if needed, turn out with enough time to read the flight of the ball and prepare their action. Whilst the characteristics of blind side movement in through balls possesses many of the same characteristics as it does in crossing situations, ground through balls have one major difference by the very nature of them going along the ground. Body positioning when defending against through balls is hugely important for defenders as they seek to occupy a position that will allow them to see the ball, maintain mobility to defend against the ball & the opponent and, significantly, give them the possibility to intercept the ball amongst other aspects. Combining all of these aspects in such a short space of time is of course incredibly difficult. There is a rather common situation whereby defenders are particularly concerned with maintaining view of the opponent whilst viewing the ball from a side-on position. In these situations defenders often remove their own capacity to intercept the ball by virtue of their body positioning. With their body facing the opponent they may decrease the range of the passing lane in front of them, however they open a massive passing lane on the other side. With the feet of the defender facing the attacker a through ball that goes past the back of the defender will be severely difficult to intercept for a number of reasons. Firstly the defender is likely to have most of their weight facing the opponent and will thus take a relatively long time to completely turn and create access to the ball. Secondly this process of turning will mean temporarily losing vision of the ball and the opponent. Furthermore if the pass and the run are co-ordinated well they can direct the attacker across the defender which will give the defender a certain distance to catch up after completing their turn. Pep Guardiola’s Barcelona and 2013/14 Bayern sides often made great use of the blind side with their aerial through balls to create chances. One fairly common chance creation method they employed was an aerial switch from a half space to the opposite half space to meet an onrushing full-back. This was often effective at accessing the space behind deep defensive opposition, from this position the full-back could then square the ball across goal for runners into the box. The fact that the ball was being switched from one half space to another forces the opponents to re-adjust their body positions and on-pitch-positions in order to trace the ball’s movement and be in position to defend it. The players on the opposite side of the ball’s initial position will need to turn nearly 180 degrees as the ball flies over their heads. This needs to be done quickly in order to have access to the ball upon it’s landing and prevent the ball back into the box. Once the ball is crossed back into the centre by the full-back the players who just recently turned out to face the ball find themselves having to re-adjust their body positions again. The constant re-adjustment that the move requires, reduces the defenders’ capacity to track opponents’ runs. It is no surprise therefore that the attackers are often free in the box to convert the subsequent cross. Barcelona’s 4-1 Copa Del Rey win at Levante in January 2014 is a good example of the how potent the blind side can be in through ball situations. All four of Barcelona’s goals came from a very similar movement scheme which consisted of Messi’s diagonal through balls and Tello’s blind side runs. These situations have interesting implications for ball-far full-backs. Due to the opponent being closer than the ball, the greater focus needs to be on the opponent, thus longer time intervals should be spent watching said opponent. With brief glances to trace the ball’s movement the defender can maintain awareness of the flight of the ball, the approximate landing time and location and adjust their positioning accordingly. However such brief glances may not be enough to track the opponent. Once the ball is played it is unlikely to change its path drastically unless there is extreme wind, however the opponent can do exactly this. For this reason it is far easier to lose track of the opponents’ movement than the ball’s once it has been played. As such it follows that one needs to pay greater attention to the opponent. Furthermore adopting the body position facing the opponent earlier will help with defending the situation once the opponent receives the ball. Whereas if the defender is still in the process of turning towards the opponent once they receive the ball they are already at a disadvantage. In possession a connection is simply when team-mates possess the capacity to pass to one another through their positioning. 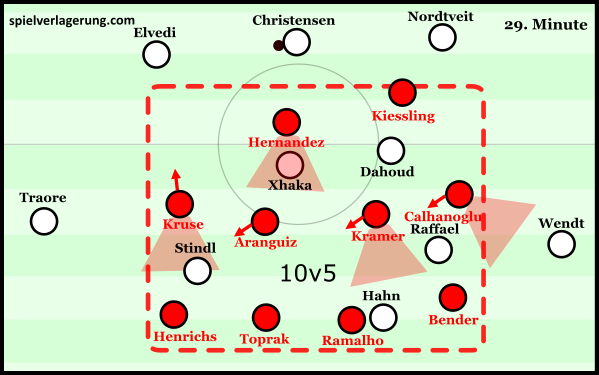 Since this is an objective of the team in possession; namely to create as many positive connections as possible, one objective of defending is to prevent this. Thus when a team is circulating the ball it is a game of acting and reacting not only to team mates but opponents as well as they aim to create or cut connections. Blind sides are a great tool to gain the advantage in these situations. One particular area it has great value in is in connecting possession from the flanks back into central areas. With the flanks being a notoriously more unstable location for possession than the centre and half spaces, it is no surprise that several teams use the flanks for pressing traps to regain possession. In these situations it follows that those actively pressing the ball leave space behind them as they press from central areas towards the flank. If the trap is not well prepared and there is a lack of support behind these players what follows is a large area to exploit behind the press. In these situations the movement of the players in more central areas is crucial and can render the opponents’ pressing efforts useless. In the GIF above the red teams’ left back is being pressed by 3 players from 3 different angles. The support behind the blue players that are pressing is poor and for that reason there is space behind the press. Although they are initially covering the nearby passing options they are vulnerable to blind side movements. With a simple movement into the gap between the pressers the midfielder creates a connection back into the centre of the field and beats the opponents’ trap. As with any action on a football pitch, the timing of movement is vital here. When moving off an opponents’ blind side there is an added element that makes for good timing. With the opponent checking their shoulders to see the attacker at certain intervals, it follows that there are periods where the defenders’ focus is elsewhere. In terms of getting free the best timing of these movements is of course during these periods. Furthermore to gain the biggest time advantage attackers can begin their movement immediately after a scan from the opponent in their direction. When the defender scans quickly to maintain awareness of the attackers’ positioning they believe they have the best possible awareness of their opponent’s positioning. Immediately after the defender has glanced in their direction, the attacker has a small time frame to make a movement without being tracked before the defender scans again. Watch in the video above as Weigl begins his movement immediately after Malli glances in his direction. Read more on Weigl’s genius here. Regardless of a team’s tactical set up a major orientation point for defenders is the body position of the ball carrier. This indicates to the defenders the more immediate danger as it shows, more often than not, the areas the ball carrier is more likely to act in the immediate future. With this in mind positioning and actions that occur on the blind side of the ball carrier are less likely to be well reacted to, prepared for and ultimately covered. This creates interesting attacking potential and is key to some common offensive combinations; namely one-twos and 3rd man runs. A “one-two” is simply where the ball carrier passes to a team-mate and moves before receiving a return pass. They are commonly used in offensive situations to create separation from markers and bypass several opponents to create goal scoring chances. But why are they effective so often? Essentially there are two reasons behind this; the perceptual reference points being split and the speed of the actions. With the ball’s location moving at the same time as the opponent’s, the defenders’ main visual reference points are effectively being split. For this reason it is not possible for them to act on both simultaneously. Focusing on the ball alone risks leaving the opponent free to run behind them, whilst focusing solely on the opponent may mean not being able to track the direction of the return pass. The aspects mentioned above inherently refer to the other main reason one-twos can be effective which is the speed that they take place at. Whilst it is difficult for defenders to track both the movement of the ball and the runner this is only the case if the actions take place at speed. With a one-two taking place at speed the defenders will have to prioritise quickly making them more prone to errors of judgement. Being a more complex version of a one-two there are more reasons why 3rd man runs can be so effective. One relates to the point made above about the body position of the ball carrier. This body position suggests to the defenders that he will interact with the “2nd man” and they prepare their actions in relation to this possibility. With their focus on the ball carrier and the “2nd man” the 3rd man’s movements are not prioritised or prepared for. This means the 3rd man’s initial actions are out of the immediate perception of the defenders. This is particularly the case when one considers the processing limitations of the human brain. Some psychologists believe the brain shows a “response selection bottleneck” taking time to prioritise and then process when asked to perform several tasks. Others believe the brain shows “adaptive executive control” which immediately prioritises the tasks at hand. What is clear is that the brain cannot process numerous tasks or pieces of information simultaneously. Yet this is what defending a well-executed 3rd man run requires. Of course no single defender is required to defend against both the ball carrier, the 2nd and 3rd men. However from here arises two issues. Firstly the defenders who will have to defend against the 3rd man are far less likely to be aware and anticipate danger due to both the body position of the ball carrier and the position of the ball. Secondly the whole sequence has implications in terms of how best to defend against it. This is problematic because those who are required to defend against the 3rd man are likely to be less focused at the start of the move. Once the movements of the 3rd man are reacted to by the defenders he often has significant dynamic superiority due to starting his run far earlier than the defenders started tracking it. This makes it severely difficult to properly track the run being made. Furthermore if the 2nd man acts quickly enough he can release the ball to the 3rd man whilst the opponents are putting structures in place to press him which will increase the space for the 3rd man to operate in the next phase. A well-executed 3rd man run combination thus exploits another weak-link of humans’ processing capabilities; namely the slow reactions to a 2nd stimulus. If the initial ball-carrier and the interaction with the 2nd man provides defenders with the initial stimulus then the interaction with the 3rd man provides the 2nd stimulus. Psychological research has shown that humans are slow to respond to a 2nd stimulus that comes so quickly after an initial one as they are still processing or in the act of reacting to the first. This phenomena is known as the Psychological refractory period. Since humans are slow to react to a 2nd stimulus it makes sense to increase the amount that they have to do or react to in these situations. The advantage of this can thus be felt most strongly when the pass to the third man is in the opposite direction to the pass before. Such combinations mean the defenders will have to prepare and begin shifting in one direction before quickly needing to move in the other. Since the reaction to this will be slow the 3rd man can be released in a situation where they are almost totally free from defensive pressure. This change of direction exists in both a horizontal and vertical sense. In a horizontal sense this direction change is manifested in 3rd man combinations that switch the point of attack from one side to the other. In a vertical sense, the “up-back-through” combination where the ball is played forwards, laid back and then played through can help a team reap the benefits of the change of direction. These human processing limitations and the dynamic advantages they can so frequently generate are a major part of what makes well-executed 3rd man runs so effective at creating goal scoring chances. Through analysing some of the concepts of Juego de Posicion and how they interact it is clear that a strategic use of the blind side is an inherent aspect of the game model. One of these concepts is the necessity of retaining presence between each oppositional line of defence. This is vital for creating the conditions to progress attacks both directly and indirectly. This positioning behind lines of defence already implies blind side positioning, and when we combine this with the necessity of positioning in the gaps between opponents we arrive at blind side movement. Given what we know about the presence of defender’s being able to block space directly behind them, players positioned behind lines have to move and constantly react to the opponents in front of them to create the connections and angles for progression. They are therefore engaging in blind side movement. Furthermore the central tenant which is the strategic use of possession as a tool to destabilise opponents inherently hints at a focus on disrupting the visual field of opponents. The reason possession is focused on as a tool of generating advantages is because of the importance it holds for defenders as a reference point in body positioning and on-pitch positioning. This knowledge is behind the idea that shifting the ball quickly will require frequent changes to the positions and fields of vision of defenders until a point where it becomes too quick for them to adjust. Although the blind side can cause significant issues for defenders it can, and often is, also be used to their advantage. Out of the blind side spawns a defensive technique that is vital to most defensive systems; cover shadows. Cover shadows are essentially when a defender positions themselves between the ball and an opponent thus cutting off the passing lane to the opponent, in effect covering the pass with their “shadow”. Whether explicitly or implicitly cover shadows are used in almost all defensive systems, man-marking is the main exception. Strong usage of cover shadows allows a player to defend against two opponents. The merits of cover shadows in pressing as opposed to man-orientations are easily demonstrable. In the first image above the lone forward attempts to prevent the opponents from building through their defensive midfielder by situationally marking him. While he is likely to be successful in his objective there are still alternative viable build-up methods available to the ball carrier. Furthermore the blues will lack access to regain possession due to the lack of pressure on the ball carrier who will be free to progress and prompt one of the opposing midfielders to move out of position. In the next image the forward presses the ball carrier whilst using his cover shadow to prevent the pass into the holding midfielder. The advantage is clear as his team can maintain the access required to force the ball carrier into an action whilst simultaneously preventing them from building through the defensive midfielder. Furthermore with the man-orientation on the left the defensive midfielder can potentially still be used for a wall pass as he remains closer to the ball than his opponent and therefore retains the ability to receive the ball. With the cover shadow however the pass into the defensive midfielder is simply not viable and attempting it is highly likely to lead to a turnover of possession. The merits of cover shadow usage are equally demonstrable in deeper areas of the pitch and huge variation is often visible in the way different teams defend the ten space. The blue side are very man-oriented particularly against those trying to play between the lines. There are several issues with such defending which have been covered extensively on this platform. However in this case the most obvious issues are the large distances between the players which mean they cannot offer defensive support to one another. Another is the need to have an overload at the back for some element of stability, this means they have an underload further up. The opponents use this well to sequentially draw out the defenders and destabilise their structure. By contrast the reds use their cover shadows to protect the space between their lines which has numerous benefits in comparison. As mentioned above, they maintain access to the line of opponents in front and can cover the opponents in the line behind simultaneously. Essentially meaning the forwards and midfielders can defend against two players each. Furthermore they maintain a cohesive defensive shape meaning they can support each other in defensive actions and exert control allowing them to force the ball away from dangerous areas. The same centre back switch and vertical pass that destabilised the man-oriented defence is easily dealt with through strong defensive support. Going back to the attentional issues a defender faces with players positioned on their blind side, there are ways around this on both an individual and collective level. Psychological research has shown that training allows the automatization of processes which in turn means the tasks will require less attention. With less training, defenders may require a longer time to recognise their opponents’ positioning and align themselves in the desired manner. Whereas a highly trained individual who has learned the skill of shoulder checking will take far less time and far less attentional focus to do the same task. The benefits are clear, with less time required to pick out the relevant details upon checking their shoulder the defender will be able to attend more closely to the ball carrier. The burden of blind side defending can be reduced through strong defensive support. Through strong compactness and the dynamic element of keeping pressure on the ball, teams can retain a stronger capacity to defend against players positioned behind them. Although the individuals will still need to be aware of what is behind them, it becomes far more of a group effort with the players sharing responsibility for the space between them. The benefits are retained even when the coverage of passing lanes is not perfect as the high level of defenders in the vicinity can make opponents hesitant to pass into such areas. Furthermore the ball can be forced away from the area with the distances between defenders allowing them to outnumber opponents within their block. In pressing situations approaching the ball carrier from their blind side is a potentially very effective method. The main issue here for the ball carrier is that they cannot see the opponent who is approaching them meaning they are often not aware they are being approached. This causes the ball carrier significant issues. Of course if they do not know a defender is approaching they may proceed as if they have time and space and risk being caught in possession. Furthermore even if they are made aware of onrushing defenders they will find it difficult to know which angle they are being approached from without seeing the opponent. This makes the selection of actions far more difficult. Decisions such as what direction to pass in or what direction to move in become almost impossible to make well without this vital awareness. Defensive blind side usage is inherent in backwards pressing. Backwards pressing is essentially the act of pressing an opponent who is already behind your position on the pitch. The GIF above is a hypothetical pressing trap with strong use of the blind side. The two forwards situationally mark the opposition centre-backs to force the keeper to play into the defensive midfielder. The pass is left open intentionally as it goes into an area where they can create a defensive overload and outnumber the ball carrier 4v1. The ball carrier is approached from two almost opposite angles which makes his life particularly difficult. He needs to check his shoulder to be aware of the direction and speed at which he is being approached from behind him. However doing so will mean temporarily taking his eye off the opponent approaching from the front which makes him vulnerable to an attempt to regain the ball. These structural advantages in the press make recovering possession far more likely. Slight movements to the ball carrier’s body position will change their field of vision and in turn their blind side. In these situations teams that strategically use this to regain possession can be seen curving their angle of approach in order to remain on the ball carrier’s blind side. Blind side pressing infers approaching an opponent from behind and this of course has different characteristics to more traditional tackling. When making an attempt to regain the ball from behind an opponent there are a number of differences in the characteristics in the actual tackle to more conventional challenges. Of course tackling directly from behind is hardly viable due to the need to go through the opponent and the rules surrounding this. Therefore the approach must be made from the side. When tackling from the side the aim is often to flick the ball away as the tacklers take care to avoid the forward motions of the ball carrier. The timing of the challenge can have a big influence on the subsequent events. For example making the challenge immediately after a loose touch from the attacker can create a clean regain where the tackler either goes straight into a dribble or passes the ball in the same action as the tackle. However making the tackle whilst the ball is close to the opponent and they are in the process of an action has high potential for winning fouls. As the ball carrier swings their foot back before an action (be it a pass, shot or clearance) they temporarily leave the ball uncovered which can create space for a tackle to be made. Furthermore this is a good time to make the challenge as the focus of the ball carrier will be almost entirely on the pass, shot or clearance they are in the process of making. This is used at times by attackers to win penalties; by approaching defenders as they are about to clear the ball, they can take the ball away and take the hit of the defenders’ swinging motion. Blind side pressing lends itself more naturally to counterpressing situations for a couple of reasons. Firstly the team that just regain the ball often pass vertically in order to make a quick progression towards the opposition goal. Depending on the distance and speed of the pass this can force the player to receive the ball facing their own goal. In addition to this, those who are tasked with blocking his route to goal are usually stationed behind the first receiver. In these situations if the defenders move forwards to challenge the ball carrier they will automatically be approaching the attacker on the blind side. Sergio Busquets is an example of a player who does this well. With his strong positioning and anticipation Busquets is often on hand to press the first receiver who is often still facing his own goal at the time. Is it possible to have no blind side? Technically the answer here is no due to the natural limitations of humans’ viewing capacity. However with effective scanning it is possible for a player to have a 360 degree picture of what is happening on the field and thus have no blind side. The idea of pre-orientation, post-orientation and orientation during a football action were conceptualised by Marcel Lucassen at the DFB, for their coaching education and elite player development. Essentially this refers to scanning the field before, during and after a football action to maintain a good awareness of the game situation around a player. This enhances the players’ ability to select an appropriate action by giving them information on the positions of the ball, team-mates and opponents. Whilst this piece has covered the main aspects and potential advantages teams can benefit from with strategic use of the blind side there is still further scope for discussion and analysis on this topic. Aspects such as the use of the blind side in defence to prevent opponents from turning towards goal, the potential attackers have to use this to turn and the use of scanning in all phases of the game are possible topics for the future. As you can see the blind side is an aspect that has an influence on every phase of the game. Whilst they are occasionally referred to by pundits, commentators and other football people, the full potential that comes with it is not often recognised or understood. Furthermore some of the aspects detailed in this analysis are referred to or mentioned without the understanding of the processes. It’s not uncommon to hear a commentator blast a defender for “ball watching” but does that simple criticism reflect the true difficulty of these situations? It is interesting that women have slightly larger visual fields then men. Would be great to see some difference in action between women and men. Great article on a very interesting topic. I think the best way to eliminate your blind side as much as possible besides looks over your shoulder etc. is communicating, talking, using another sense then vision. Excellent article JD.You came up with some wonderful and insightful stuff. I loved it. I was hoping may be you could write a detailed article on the dynamic and static characteristics of half spaces and how the position; texture and opposite side half space orientation vary depending on various situations. And yes; I have read RM’s translated article but I want a slightly different perspective from you on that. I hope you will consider my request….take care then… Bye.